Running after 15 years in woods. 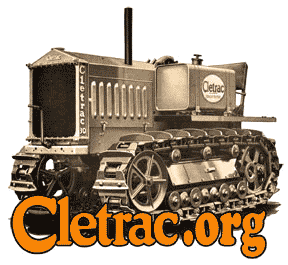 Cletrac.org > Shows, Events, Video > Video Clips > Running after 15 years in woods. Bought this 1947model BD in July o9. It sat in the woods for 15 to 17 years. Was buried in the ground about 8" and had a tree laying across the hood with brush growing up through the machine. My sons and I spent Saturday Digging this thing out of the trees and brush then tearing apart and cleaning the entire fuel system and going over the whole crawler. The bottom of the fuel filter was rusted off and water got in the lines and seized up the supply pump. we spent 2 hours pounding the plunger out of the pump. We used polishing compound to clean the pump then put an over sized seal in it, works great. Would have started it Saturday night but I broke a fuel line fitting in the bottom of the pump and NAPA was already closed had to wait until Sunday . The video was shot about an hour after it was running. This video is the first time it moved under its own power in about 15 years and us driving it out of the woods to be hauled home. Re: Running after 15 years in woods. Forgot to tell where video was shot . Property the Cletrac was on is private property in Malden Pa. near Brownsville Pa. it borders the grounds where the National Pike Steam Gas and Horse show is held. When my son gets it out of the woods you can see the parking area in the background on the video. Plans are to do complete restoration. Right now it is in the garage tore down to the frame. My sons and I have cleaned the whole thing of rust and painted the frame, main case and final drives. Have lots of pictures so far, When I have more time I will try to post some.